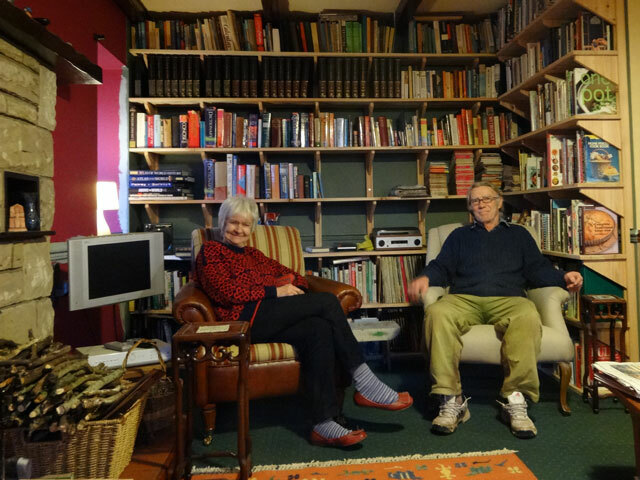 This has been Digger’s project over recent times: designing and constructing this bookcase which neatly fills the alcove beside the fireplace in their lounge. In recent days books have been emptied from the barn and loaded onto the shelves; the empty spaces are for books which are piled upstairs and will soon make their way down to the new library. It looks good! I rose, walked Mix, and got the Bothy ready for my meeting this morning with Alan, the Presbytery Business Convener. In my new job as Presbytery Clerk I am responsible for arranging a number of these meetings and, before the first one took place, I was anxious to talk it all through with the convener. I enjoyed meeting with Alan very much. By the time he left, Rachel and Mum (who had already been to the hairdresser) were setting out for lunch at Clare’s. (Some lunch – it was nearly five before they returned home!) I made myself a snack and then settled down to get everything properly in order for the Business Committee which met this evening in Duns Church. That done, Mix and I went for a walk before it got dark. I really enjoyed the Business Committee – when things needed done, people volunteered and there was a real enthusiasm and lack of cynicism in the meeting. I had gone early and had the key to the hall. I went in and groped everywhere but couldn’t find a light switch. David arrived shortly afterwards and immediately discovered the switches – of course, being equipped for folk of all ages and abilities, the switches were just where I had been feeling for them ... but much lower down. We were out by half-past eight and to celebrate I went for a Chinese take-away. Life is just too good. I came home, had supper and then prepared and circulated the minutes before walking Mix and retiring to bed. Another great day.